During the 1980s, extremist groups operating within both Tamil and Sinhalese communities were a grave threat to political stability and democratic institutions. Like Northern Ireland and Lebanon, Sri Lanka had become a country in which the vicious cycle of escalating violence had become so deeply entrenched that prospects for a peaceful resolution of social and political problems seemed remote. Extremism was generationally as well as ethnically based: many youth, seeing a future of diminished opportunities, had little faith in established political and social institutions and were increasingly attracted to radical solutions and the example of movements abroad like the Popular Front for the Liberation of Palestine. Perhaps surprisingly, the first major extremist movement in postindependence history was Sinhalese and Buddhist rather than Tamil and Hindu. The JVP, an ultra-leftist organization established in the late 1960s by Rohana Wijeweera, attracted the support of students and poor Sinhalese youth in rural areas. In April 1971, the JVP led an armed uprising that resulted in the death of thousands of the rebels at the hands of the security forces (one estimate is 10,000 fatalities). The historian, K.M. de Silva, calls the 1971 JVP insurrection "perhaps the biggest revolt by young people in any part of the world in recorded history, the first instance of tension between generations becoming military conflict on a national scale." 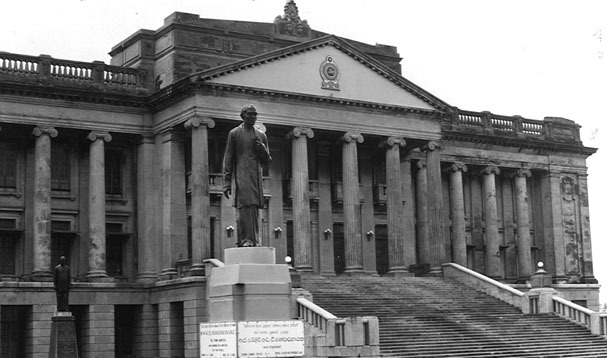 Although it suppressed the poorly organized revolt with little difficulty, the Bandaranaike government was visibly shaken by the experience. Fears of future unrest within the Sinhalese community undoubtedly made it reluctant, in a "zero-sum" economy and society, to grant significant concessions to minorities. Although the JVP was recognized as a legal political party in 1977 and Wijeweera ran as a presidential candidate in the October 1982 election, it was banned by the government after the summer 1983 anti-Tamil riots in Colombo and went underground. 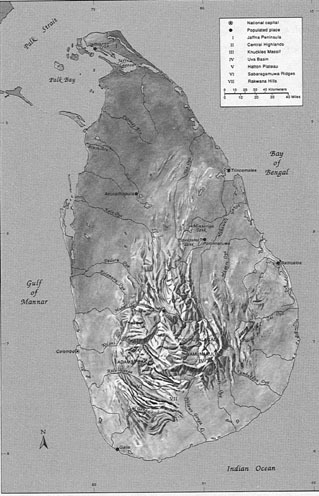 By the late 1980s, it was again active in Sinhalese-majority areas of the country. The JVP cadres organized student protests at Sri Lanka's universities, resulting in the temporary closure of six of them, and led sporadic attacks against government installations, such as a raid on an army camp near Kandy in 1987 to capture automatic weapons. But they were also suspected of establishing links with Tamil militant groups, especially the Eelam Revolutionary Organization of Students (EROS). Government intelligence analysts believed that the JVP, in tandem with EROS, was attempting to organize a leftist movement among Indian Tamils in the Central Highlands (see fig. 3). This was a disturbing development since the Indian Tamils had traditionally been docile and politically apathetic. In 1987 a splinter group of the JVP, known as the Deshapremi Janatha Viyaparaya (DJV--Patriotic Liberation Organization), emerged. The DJV threatened to assassinate members of Parliament who approved the conditions of the July 29, 1987 Indo-Sri Lankan Accord, which it described as a "treacherous sell-out to Tamil separatists and Indian expansionists" and said that it would take the lives not only of parliamentarians who approved it but also of their families (see The Janatha Vimukthi Peramuna , ch. 5).